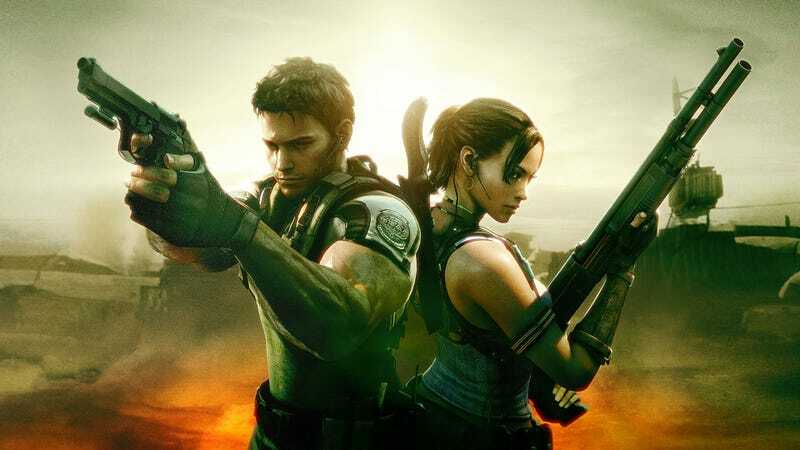 Resident Evil 5 was rereleased on Xbox One and PS4 this past week. I was pretty excited for it! I had a lot of fun playing co-op back when the game was initially released in 2009, and I was looking forward to taking Chris and Sheva back to Africa for another spin. But... oh goodness. Where to start? I have long defended Resident Evil 5, even on this very site! I often call it “good for what it is”, which is sort of like the Mighty Number 9 “better than nothing” statement, now that I think about it. Warning: Spoilers for Resident Evil 4 and 5 to follow. To be fair, Resident Evil 5 is a far superior game to Mighty Number 9. Resident Evil 4 has great gunplay, so practically carbon copying it to Resident Evil 5 was certainly a good decision. The game looked great in 2009, and it looks even better here with a fresh coat of paint on it. The art design in the Resident Evil series has always been a strong point, and that extends to this game. The story is ridiculous schlock, mostly due to a heavy dose of Albert Wesker. But it is fun schlock, and RE5 doesn’t ask you to take it to to seriously. Wesker also helps cure RE4's biggest narrative issue: the lack of a convincing lead villain. The co-op gameplay is a bit of a mixed bag. To be blunt, it is the only way to play the game. It is a lot of fun to play with a friend, hunt for treasure, and blow up waves of enemies. Some of the best times I have ever had gaming involved my friends and I leveling up our weapons to stupidly powerful degrees and rampaging our way through the game. The problem isn’t the co-op itself, but what it’s implementation does to the rest of the game. Playing alone is where the game’s flaws go from being circumstantial to glaring. Generally speaking, Sheva can look after herself and is pretty helpful when it comes to taking on huge numbers of foes. However, Sheva’s AI makes some really baffling decisions. The most frustrating of these is her incessant need to “top off” your health, even if you are low on healing items. She also wastes ammo by relying too heavily on bodyshots instead of the tried and true headshot/melee attack combination. It is best to give her a weapon type you don’t like and make her backpack all of the ammo around for it. Finally, she has a tendency to stand exactly in your way. I have never gotten her stuck in a door or anything, but it can certainly be a nuisance. The level design suffers the most from the insertion of co-op. Rarely do the co-op mechanics feel well designed, or even integral to the experience. They are usually along the lines of “one player stands here while the other pulls a lever to open a door over there” or “both players pull levers at the same time”. The somewhat circular, objective based level design of Resident Evil 4 has been replaced by fighting through enemies to get from point A to point B. Perhaps that explains why the environments in Resident Evil 5 are not nearly as memorable as the Village, Castle, and Island environments in Resident Evil 4. The most memorable part of Resident Evil 5 is the middle section where you are fighting infected tribal enemies, and not for the right reasons. This part of the game was debated to death when this game was new, and I am not going to spend too much time hammering on it here, other than to say it echoes the worst parts of the “dark continent” trope. Another disappointing aspect of Resident Evil 5 is the boss fights. RE4 featured awesome encounters, such as Del Lago, Verdugo, and U-3. You fought the El Gigante multiple times, but other than that, the encounters were thrilling and provided their own set of challenges. Resident Evil 5's only real memorable encounter is the final fight against Wesker, and that has more to do with the fact that it takes place in an active volcano, features that ridiculous rock punching scene, and Wesker’s insane ramblings about purifying the earth. Otherwise, there isn’t much to hold on to. You fight the Uroboros in various forms and a bat monster called “Popokamiru” twice. The Ndesu is basically the El Gigante from the last game, and he is killed during what is essentially a Call of Duty style turret section. Speaking of turrets, the boss fight against Irving culminates in another tired turret fight. The bosses are designed around a co-op experience, so fighting them alone can prove unnecessarily frustrating or even outright boring. Nothing in this game holds a candle to tip toeing around the blind Garador or the multi-tiered fight against Krauser. Even with all of these complaints, Resident Evil 5 is far from terrible. It is just terribly disappointing when compared to it’s predecessor. If you want a solid co-op experience, Resident Evil 5 comes highly recommended. If you are only planning on playing solo, it is best to wait until August 30 when Resident Evil 4 is rereleased. When I am not writing about games, I sometimes stream them at twitch.tv/omegaredpanda. Also, follow me on Twitter for updates on silly things I write. For updates on all things TAY, follow us on Twitter and Facebook.